Board meetings are held the third Wednesday of each month from 5-6 pm at Lifetime Networks. Our Annual General Meeting will be held at Lifetime Networks, #102 – 4090 Shelbourne Street, Victoria BC, from 6:30 – 7:30pm on Wednesday March 20th, 2019. RSVPs would be greatly appreciated! During this year’s AGM we will be presenting our annual awards followed by a presentation by Karla Verschoor, Inclusion BC Executive Director on the topic of supporting abilities, promoting action and advancing rights. Drawing from the recently released provincial budget, she will share how Inclusion BC will focus their efforts in the year ahead. Clothing Donations – We are always accepting clothing donations and small house hold items at our clothing bins. Visit our Clothes Drop page for more information and for bin locations! If you are unable to access one of our bins but have donations to share – please call us at 250-477-4112 or email carlene@lnv.ca to organize home pick ups! Hockey – Get reduced tickets through Lifetime Networks for Royals Hockey games! Stay tuned for more information! Karaoke! Our next Karaoke Party for friends of Lifetime Networks and Best Buddies (UVic Chapter) will be on Thursday, March 14, 2019 in the UVic Student Union Building – Vertigo Room, 6:30 pm – 8:30 pm. 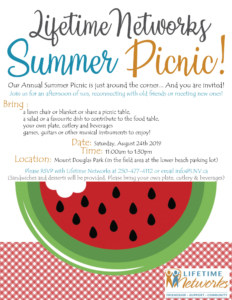 Please RSVP to Lifetime Networks 250-477-4112 or info@Lnv.ca. Table Talk Parent Group happens the fourth Thursday of every second month from 7-9 pm. This is a casual time to connect with other parents. Please click here for information. Wills and Trusts, information sessions with Network Manager, Heather Bergink and Lawyer Dustin Marnell from Horne Coupar occur frequently at Lifetime Networks. Information includes conversations on future planning, wills and trusts. Our next meeting will be Wednesday, March 27, 2019 at Lifetime Networks, 5:30 pm – 7:00 pm. Please RSVP to Lifetime Networks 250-477-4112 or info@Lnv.ca. RSVP’s are required as seating is limited. The date of our 16th Annual Gala Dinner and Auction is now set! Join us on Saturday June 15th, 2019! (Registered Charity # 873 660 625 RR0001) and an annual highlight for those who attend each year. We were pleased to again have MAX Furniture and The Wilson’s Group join us as our Co-Title Sponsors and to have had Country Grocer step up again to sponsor our dinner! We are happy to announce that through our 2018 Auction and Gala over $60,000.00 were raised to build lasting friendships and support for people with disabilities. — Together we hope to raise even more for our 16th Annual Gala and Auction in 2019! Gifts from our sponsors are instrumental in our ability to achieve our mission: to foster networks of friendship and support for people with diversabilities to enhance community. For photos from the 2018 Gala, please visit the photo gallery ! Get involved this Earth Day with Lifetime Networks’ donation drive! Lifetime Networks invites you to celebrate Earth Day by removing thousands of kilos of used clothing, small household items and refundable drink containers from the environment. We will accept clothing, small household items and bottle donations through its recycling program and turn them into money to support more participants at Lifetime Networks. Please bring donations to the school by April 12th. If you are unable to drop off donations please call Lifetime Networks at 250-477-4112 to organize pick up. In addition to helping our planet, these donations will also help Lifetime Networks continue to support more members of our community, with over $3000 raised in 2018! Participate in the 39th annual GoodLife Fitness Victoria Marathon while supporting Lifetime Networks! Lifetime Networks is a benefiting charity (Registered Charity # 87366 0625) with the GoodLife Fitness Victoria Marathon. To donate online: click here! Registration: *Remember to Register with GoodLife Fitness Marathon to participate in the race http://runvictoriamarathon.com/registration/. Year after year we are proud to be involved with the GoodLife Fitness Victoria Marathon. In 2015, the Lifetime Network Cruisers won 2nd place in the half-marathon Check Charity Pledge and one of our runners won 1st place in crossing the finish line with a visual impairment! In 2016, our Team raised $11,000 for Lifetime Networks Bursary Program. We look forward to what 2018 will bring! For help setting up an electronic Donation Page on Canada Helps or for any other questions please contact Carlene at 250-477-4112 or Carlene@Lnv.ca. Thank you sincerely for helping to make a difference! Each year before Christmas, Lifetime Networks friends and family gather together at Royal Colwood Golf Club and share in a breakfast buffet, sing some festive songs and even enjoy a visit from Santa. It’s a morning you won’t want to miss! Please know that seating is limitted to 80 people. RSVPs are required. Unfortunately, we may not be able to accomodate everyone who wishes to attend. Join with the Lifetime Networks family, Best Buddies, social groups and many others for a wild evening of singing, fun and ice cream! The last karaoke rocked with over 100 participants, some great singing, some enthusiastic singing, and loads of laughs! Hope you can join us next time! in the Vertigo Room, Student Union Building at the University of Victoria. Please contact Noah at (250) 477-4112 or Noah@Lnv.ca to RSVP or for more information. Join us for an afternoon of sun, reconnecting with old friends or meeting new ones! – games, guitars or other musical instruments to enjoy! Are you a parent/caregiver wanting to connect with other parents? Join us for Table Talk! – Sometimes there may be an educational component. – And always good company and snacks! Please RSVP with us info@Lnv.ca or 250-477-4112 for our next Table Talk. The DeviANTs are a self-named musical theatrical comedy troupe that rose out of Lifetime Network’s Drama Club program. Featuring adult artists with developmental disabilities, they have been creating and performing for the last 2 years and will present completely original songs and sketches created over the last 4 months. Most recently, the DeviANTs performed Queen Kathy’s Holiday Spectacular! at Langham Court Theatre. They also performed as a majority of the cast of “The Great Big Show” at the McPherson Theatre in February 2018. The show was an enormous hit, selling over 1000 tickets and changing audience’s perceptions of people with diversabilities.